Field #1 on East side, Field #2 on West side. Field # 1 on South side, Field #2 on North side. For practice sessions Crossroads field has been split into two sides and four sections per side. 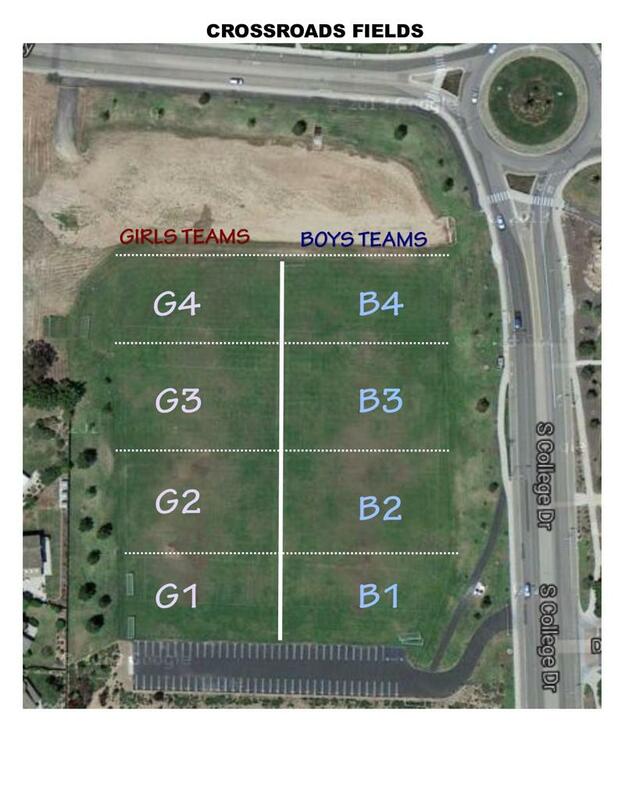 The Girls side is the west side of Crossroads, and the Boys side is the east side of Crossroads closest to College. The field sections (G#1, G#2, etc.) go from south to north with G#1 and B#1 being the section closest to the paved parking lot. Obviously, if there are less teams on your night, you can make your area bigger. 1. Always put away and lock the goals before you leave. 2. Please pick up any trash. 3. Please be courteous to the other teams. 6. Saturday scrimmages and practices need to be approved by the CVSC Field Scheduler. If you have any questions, please contact Field & Equipment Manager, Francisco Ruiz at 805-720-4333. Crossroads Soccer Fields are the home fields for CVSC and are located on College Ave, two blocks south of Betteravia, across the street from Community Volkswagen. From either North or South Hwy 101, take Betteravia Road exit. Go West on Betteravia to College. Turn Left onto College. Go through the round-a-bout and the fields are on your right. Overflow parking available in the dirt parking lot off Southside Parkway.